1. Read the small print - Check carefully what is included in the deal and that you understand the terms and conditions. Key things to look out for include what charges are there if you pick up or drop of your car outside of the pre-booked times, what is the policy on fuel, are you liable for the excess payment, even if the damage is not your fault and is there a limit on your daily mileage. For example, most policies have unlimited mileage, but some limit you to 100 miles a day and charge Pounds Sterling 1 - 2.50 for every extra mile. 2. Check what insurance is included with the car - When hiring a car in the USA, Canada, the Caribbean, Central and South America, you are required to have CDW ( Collision Damage Waiver : www.icarhireinsurance.com/insurance-information-centre/cdw-ldw-c .. ) / LDW ( Loss Damage Waiver : www.icarhireinsurance.com/insurance-information-centre/cdw-ldw-c .. ) - covering damage, theft and loss of use of the rental vehicle, Supplemental Liability Insurance (SLI) - covering Third Party; i.e. other vehicles and Super CDW is recommended (excess insurance). 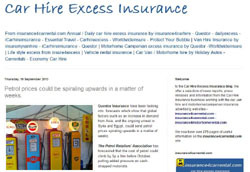 You have the choice of hiring a car inclusive, or exclusive of insurance but make sure you purchase it before you arrive as cover bought from the car rental desks generally costs between Pounds Sterling 10 - Pounds Sterling 20 a day, but www.iCarhireinsurance.com: charge from Pounds Sterling 4.99. 3. Check your vehicle - Check the vehicle carefully before you drive away for any damage and make sure that these are noted on the rental agreement. Taking photos of the car on your mobile if there is any damage is a good idea if you are concerned. 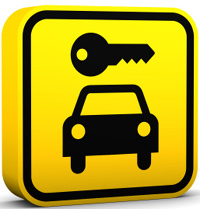 Allow plenty of time when returning your vehicle, to allow it to be inspected by a rental company employee. If it is too dark, or poor weather makes it difficult to check the vehicle, again make sure that this is noted on the rental agreement and inform them as soon as you notice something. 4. Driving abroad - Make sure you are aware of the driving rules and regulations of the countries you will be visiting. In some countries it is the law that you carry reflective jackets and vehicle warning triangles. 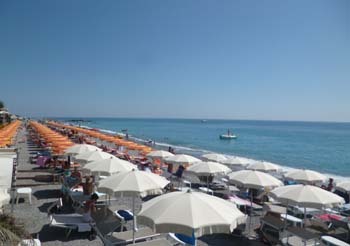 Non compliance could be an on the spot fine of between 90 and 135 Euros. Make sure you aren't breaking any rules before you drive in a new country. 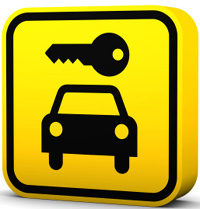 If you are hiring a car in the UK make sure that your insurance covers you for driving near your home or In-Country. Many policies include distance restrictions from your main residence and are only valid when you hire a car abroad, so make sure that you are covered." 5. Driving license, passport and credit card - When hiring a car you will need a full driving licence, relevant for the type of vehicle you are hiring. You are also likely to need additional identification like a passport or utility bill. Most rental companies will also require you to have a credit card, as many either take a copy, or some actually freeze the excess amount in your account, until the car is returned safely to them. Make sure that you have enough credit on your card for this to happen, and still let you use the card if you need to during the rental. Ernesto Suarez, Chief Executive Officer of iCarhireinsurance.com said, "A lot of people find hiring a car confusing. Many are surprised when they are stung with unexpected charges when their flight is delayed and they have to pick up their car outside of the agreed times. Others don't realise that they are liable for the excess payments even if the damage done to the car is not their fault. We have tried to take the mumbo jumbo out of car hire with this guide." 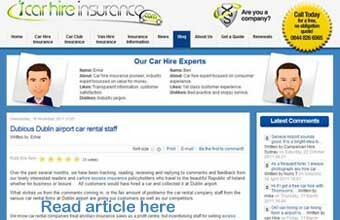 What is Car Rental Insurance @ iCarhireinsurance?